Welcome to the December 2016 edition of the IPC e-newsletter. 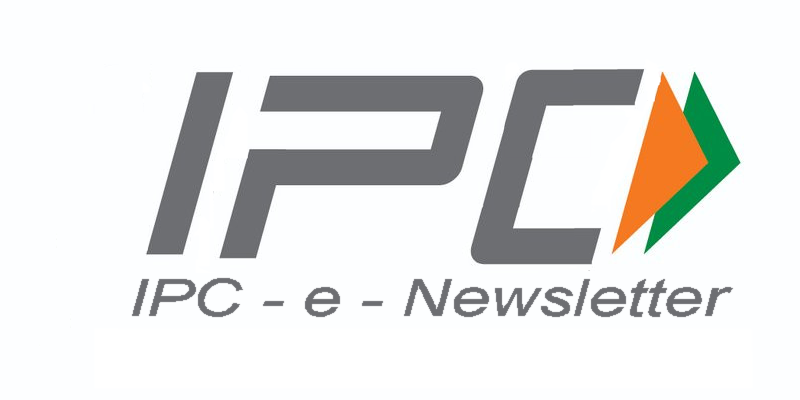 The IPC e newsletter is distributed free to more than 5000 people around the world. The global powder coating equipment market is expected to grow to a $2.14 billion industry by 2024, according to a report from Grand View Researcher. 'The market is expected to witness significant gains over the forecast period on account of increasing usage of powder coatings in automotive, consumer goods, architectural, furniture, general industries, and defense applications,' said the Grand View report. Powder coating market growth is driven by high automobile production all across the globe. Titanium dioxide manufacturers are pushing for additional price hikes for deliveries in the first quarter of 2017, due to inflationary pressures associated with raw material costs. Powder coat guns are poised to witness a 7.5 percent compound annual growth rate in the next seven years due to its lightweight nature and ease of color change. The consumption of guns for spraying powder coatings on metals, ceramics, glass, and plastic surfaces is expected to augment demand in the coming years, Grand View said. ASCI upheld a complaint against Berger Paints India, which claimed in an advertisement of Berger Express Painting that You will be amazed to see how the trained painters use the hi-tech sanding machines to scrape your walls without any dust and use the automatic paining machines to paint the walls perfectly in no time. Chennai: In this day and age when people hardly find time even to do their daily chores at home, a group of committed members of the public took up the tough task to cleaning and restoring the Corporation library on Warren Road, Mylapore. They not only succeeded in achieving their goal but also did it within a matter of seven hours. Meet Krishna Kumar Suresh, the founder of the NGO, Thuvakkam, who guided his team of 25 volunteers to achieve this feat. 'News Today' interviewed him to know more about the initiative. Q: What made you and your team venture into this tough task? A: As an NGO, our job is to create awareness about social issues. But when we start doing our work, in most situations, we get discouraged due to lack of cooperation from people. At one point of time, we decided that we should achieve something and leave our mark in society. We wanted people to know our strength as a team. We wanted to serve society in action and not in words. This motivated us to venture into this task. Q: How did you go about achieving this? A: One of the renowned paint manufacturers, Nippon Paints, came to know about our work through the media. They came forward to help us take up this initiative. We decided to paint the walls and clean up the entire corporation library on Warren Road in a night - without anyone noticing it - and surprise them the next morning. Everything went on fine and on the night of 26 November, our volunteers, comprising four girls and 21 boys, started the cleaning and painting work at 9 pm. We completed the work by 4 am. Number 448c in the Pantone system, was voted the ugliest color by 1,000 smokers. Global health authorities are trying to get more countries to mandate the use of the 'world's ugliest color' on cigarette packaging to discourage smoking. In 2012, GfK Bluemoon, a market research company under contract to the Australian government, announced that nearly 1,000 smokers had voted that a drab greenish brown known as opaque couche, number 448c in the Pantone color matching system, was the world's most repulsive color. If the liquidity crunch following demonetisation is affecting volumes, higher costs in wake of Opec oil production cuts can affect margins if companies decide to absorb the cost. The rise in crude oil prices, coming on the back of a disruption caused by demonetization, is a double whammy for paint firms. If the liquidity crunch is affecting volumes, higher costs can affect margins if companies decide to absorb the cost so as to not disturb demand. Paints and coatings manufacturer Akzo Nobel has acquired the Industrial Coatings Business of BASF India for a consideration of Rs 11.17 crore. Virginia and federal officials have reached a $50 million environmental damages settlement with DuPont chemical company, the largest agreement of its kind in state history, over the decades-old mercury contamination of the Shenandoah River system. I work as a sale (service) guy for Gema equipment in Serbia. A customer asked me for a measuring device that is able to measure parts temperature in multiple spots during time spend in polymerization oven. Which producers are most accurate, for temperatures up to 830 degrees Celsius? It's nice to hear from Serbia. I hope that your powder coating operation is going well and I am happy to help you. Indeed there are instruments designed to measure the temperature of parts in multiple locations. These devices were developed in the 1980s and are an excellent way to ensure part temperature versus time. This data is essential to knowing if your coating is developing full cure. As you probably know you should adhere to the recommended time and temperature stated on the powder coating Technical Data Sheet provided by your supplier. The most common instrument is the DataPaq Oven Tracker (see: Scheen Engineering Ltd in Hungary) but there are many other products from other equipment houses such as TQC (Nederlands) and Grant Instruments (see: Tectra Beograd in Serbia). You mention that you need the instrument to be accurate to 830⁰C which is rather high for a powder coating. This requirement may force you to consider a specialized device to be able to withstand temperatures this high. Most of these instruments use a thermally insulated box to protect the data logger while it is exposed to the heat in the oven. You will have to check with each supplier to see what they offer. We have been developing new polymers for powder coatings. One of the most critical properties is impact resistance. Our test results have been inconsistent and vary significantly depending on substrate used. In some cases the coating passes 160 inch-lbs. and with other conditions only gets 80 inch-lbs. What could be the cause of this variation? And how can we eliminate these variations? First of all, kudos to you and your colleagues for developing new polymers. Most advancements in powder coating technology are based on new and improved polymer chemistry. It's tough for us formulators to create new coatings without innovative polymers. The most common impact resistance test method is described in ASTM D-2794 2794 Standard Test Method for the Rapid Deformation of Organic Coatings (Impact). The values typically quoted in impact resistance are inch-pounds (the metric centric folks use Newton-meters) and refer to the weight times the distance (height) of the impact. Another parameter is the radius of the 'ball' or hemisphere that impacts the surface of the coating. North America typically uses a 5/8 inch diameter ball although some specifications call for a 1/2 inch one. The smaller the diameter, the higher the deformation and hence lower impact resistance. Besides the coating's inherent flexibility substrate has the most significant influence on film performance. Adhesion is affected by the type of metal, the surface profile, cleanliness and pretreatment. Impact resistance is affected by adhesion so poorly pretreated substrate will cause unexpected impact failure. On the other hand, well pretreated metal will enhance impact resistance by providing a strong bond of the powder to the substrate. In addition to metal preparation, the gauge and type of substrate significantly influences impact resistance because of the degree of deformation to the substrate. Hence 80 inch-lbs. on a ductile grade of aluminum will have different deformation than carbon steel. And certainly the gauge or thickness of the metal will also influence deformation and therefore impact resistance. Thicker gauge metal will deform less and therefore the coating experiences less stress. Coating parameters to control are mainly film thickness and degree of cure. Thinner films tend to exhibit higher impact resistance whereas thicker ones are more brittle. Complete cure is highly recommended as undercured powders will usually have lower impact resistance. Make sure your coating receives the time at temperature specified by the coating supplier. Good luck with your polymer chemistry efforts, the industry needs you. The boss is at it again. He wants me to coat some parts for a 'government'project and I am unsure as to what powder to use. These are 16 inch tubes made out of galvanized aluminum. They are for his boat which obviously means they need to withstand a marine environment. Our shop usually applies an epoxy primer, “gels” it, then follow with a polyester topcoat and then cure with a full bake. Will this be OK for the boss’s parts? Looks like you need to make sure these work out or you'll be on your boss's wrong side. I'll have to be honest with you, I can't say that I have encountered galvanized aluminum before. I will take your word for it however. My recommendation is to thoroughly clean the galvanized surface with a strong alkaline cleaner and a good, clean rinse. Alternately you could wipe the surface with a good solvent such as acetone. Allow the surface to dry then preheat the part at 375 degree F (part temperature) for a few minutes. This degasses the galvanizing which can harbor moisture and other volatiles that can cause pinhole defects. Allow the tube to cool to around 160 degree F, then apply the epoxy primer. I recommend a standard epoxy primer (not a zinc rich one) as the zinc is overkill on a galvanized surface. 'Gel' the epoxy with a modest bake of around 300 degree F for 5 minutes (again, metal temperature). Cool the part then apply the polyester topcoat and fully cure per the powder manufacturer's Technical Data Sheet. The gel bake of a primer followed by a full cure of the topcoat/primer combination ensures good inter-coat adhesion. Do this with one part and evaluate the adhesion with a non-destructive test. Tapping on the surface with a small ballpeen hammer should work. If everything looks good then proceed with the rest of the parts. Good luck with the 'government' work. I will have to consult with some of my colleagues to see what they know about galvanized aluminum.